Last night was my first team meeting of 2017, and it was great to have all of my team members there! We’re only a small group, but we’re lots of fun, and a very creative bunch, too. Everyone has their own reasons for joining – whether it’s to simply enjoy the minimum 20% discount on purchases, or to sell a few products to help pay for their own stamping hobby, or to create a business that will generate income to pay not just for your own supplies, but also extra income for holidays, bills, and anything else. I love having team members with different goals, as it gives us all different perspectives on our business/hobby, which in turn helps with giving you – our wonderful customer – the best possible service! Our team member who is the ‘hobbyist’ – enjoying the discount for personal use – came to the meeting looking forward to seeing the rest of us, but feeling rather blase about the new catalogue. Well – it was so fun to watch her feelings change, as she got to play with some of the new products (watercolour pencils, blender pens) and new stamp sets and framelits, and see them up close! Needless to say, she left the meeting feeling totally energized, and ready to order her new products, and feeling excited about using them. And sometimes that’s what it takes – just looking at the catalogue, in person or online, can sometimes leave you missing out on a lot of things – the feel of the ribbon, the beauty of the colours, or the intricacies of the thinlits or embellishments. Okay – so I digressed a bit away from our meeting, but really – that’s another reason why, if you’re a team member, you should try to attend your team meetings, even if just once every quarter. Because sharing is what we do best – and enthusiasm and creativity are contagious! For our meeting, I had asked everyone if they would bring a project sample to share with everyone, and if possible, create a kit so that the rest of us could stamp. Well, Lynn totally outdid herself, and made 2 projects for us – these adorable cards using the Moon Baby stamp set! Lynn designed the cards, and did the stamping; she let us do the colouring of the babies, moon and umbrella, using the Watercolour Pencils. 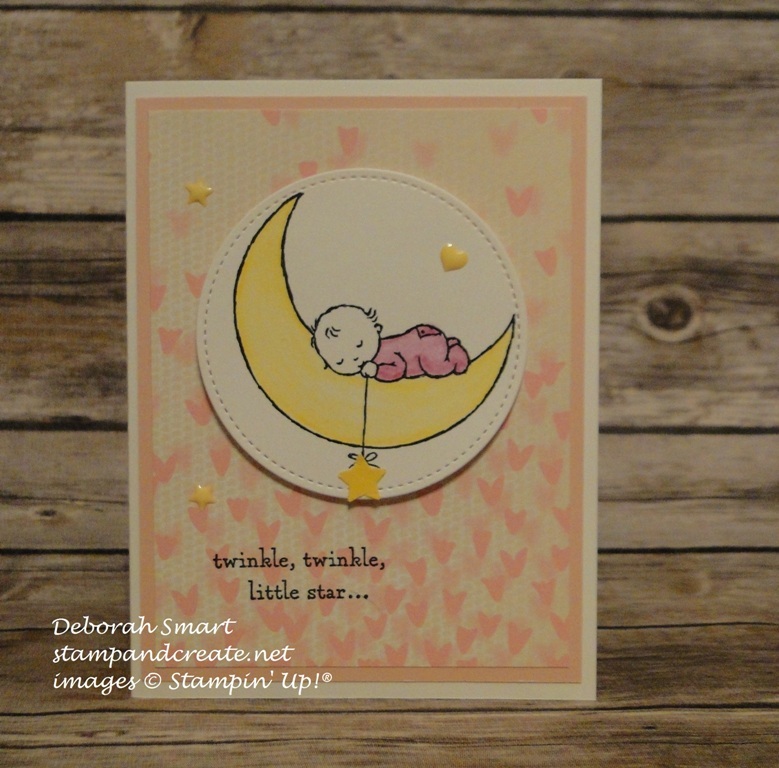 For the baby girl card, I chose to use the Rich Razzelberry pencil for the sleeper and the Daffodil Yellow for the moon. I know I’ve said it before, but I just love how these pencils blend – they’re so smooth! I added 2 stars shapes and a heart shape – these are the new Enamel Shapes that are in the Annual Catalogue. Lynn used the hearts pattern from the Falling in Love Designer Series Paper, over a panel of Blushing Bride cardstock. I just love how Lynn had stamped the clouds in Whisper White craft ink on the Crumb Cake cardstock– even layering the baby image cardstock with the card base, so that the clouds ‘line up’ when you layer the pieces! I chose the little heart Enamel Shapes for this cute little boy 🙂 The clouds are from the Lift Me Up stamp set. These cards are just so sweet – and it’s a stamp set that I probably wouldn’t have thought of buying, as my own boys are now ‘grown’. Well, I think I’m going to stop this post here; I don’t want to overwhelm you with too much at once – gotta save something for another post! I’ll be back to share mine, Chantal, and Margaret’s projects – so you’ll have to come back & check them out. If you think you’d like to join my team, and be part of the fun and sharing, I’d love to have you as part of the INKcredibly Creative Crew! If you have any questions, feel free to email me at debsmart@shaw.ca , or if you’d like to join right away, you can CLICK HERE TO JOIN NOW. And remember – if you join during Sale-A-Bration, you not only get to choose $165 in product for only $135, you also get to choose an EXTRA 2 FREE STAMP SETS! If you’d like to order any of the products used to create these cards, you can click on the images below, to go directly to my online store.